Eating lots of fresh fruits and vegetables is one part of living a healthy lifestyle. Eating all of those fruits and veggies produces a lot of seeds, cores, peels and husks. Some people think that leftover fruit and veggie bits are trash and don't realize what they could be - fertile, organic soil. Composting may be the perfect use for fruit and vegetable scraps, coffee grounds, tea leaves, spoiled foods, yard waste and other organic materials that would otherwise end up in a landfill. There are three basic forms of composting - hot, cold and worm composting. Hot, or active, Composting relies on a proper mixture of carbon and nitrogen-rich materials (browns and greens) in sufficient quantity and oxygen to allow bacteria to heat up (around 140°F) and decompose the compost. Cold Composting is what happens when a compost pile does not have sufficient mass, oxygen or nitrogen-rich material to heat up and instead decomposes more slowly and at lower temperatures. Worm Composting or vermicomposting uses worms (usually Red Wigglers) to break compost down into humus. Water - Composting in the Desert Southwest is a different challenge than in many parts of the world. In arid climates like New Mexico one of the main challenges is keeping enough moisture in a compost heap. Watering a compost pile, especially an outdoor pile, is vital to maintaining good decomposition. Locate your compost pile where it can be watered easily and frequently, possibly under a canale or downspout. Try to avoid placing your compost pile where it will receive a lot of sun exposure as that will definitely dry it out. Don't overwater your Red Wigglers as worms can't swim, just keep their food damp. Materials - Given enough time anything even remotely organic can be composted. Generally home composters should avoid any meat or dairy scraps as they will attract pests ranging from mice and rats to coyotes. Any plant materials are generally fine for composting. If your household doesn't generate lots of scraps visit your local grocer and ask when you can pick up their spoiled fruits or veggies. Or drop by your neighborhood coffee shop, as used coffee grounds are an absolutely wonderful material for composting. Shredded office paper, newspaper and cardboard can also be hot or worm composted. Chopping up large scraps exposes more surface area to air, water and micro organisms which will speed up composting. Don't add dirt to your worm compost as Red Wigglers live exclusively above ground and can't dig through soil. Volume - A hot compost pile requires one cubic yard (3 * 3 * 3 feet) of material to sustain the required heat and bacteria. Worm Composting needs at least 5 gallons of scraps and organic material to sustain a healthy population of worms. Worms also need about 1 square foot of surface area for 1 pound of healthy worms. In each case, the more material to compost the better. 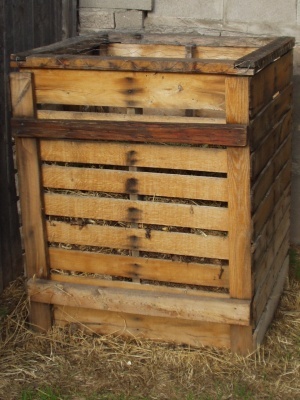 Container - Compost bins can be made of nearly any materials. My compost bin is made of 4 wooden shipping pallets that I connected with screws with a removable front and a hinged lid covered in chicken wire. I was able to collect the pallets from the local newspaper's shipping dock where they are free for the taking (I did call and ask first). The only thing I had to purchase were the hinges, as I had everything else left-over from other projects. Use materials you have or can find easily. If you aren't very skilled with tools, there are hundreds of bins available for sale at the local hardware store, garden center or online. Straw bales or spoiled hay bales also make a great compost bin which will last a year or more before they compost themselves. Be sure to shop around as a compost bin should create lots of inexpensive humus, not cost you a fortune. Time - Rome was not built in a day, nor will your compost be finished in a week. An active, hot or worm, compost will usually take three to six months to finish. Hot compost requires turning every one to two weeks to finish this quickly. If you let your compost go cold, or if it never gets hot, it will take more time. Adding some finished compost can be a great way to jump-start a new pile with healthy micro organisms. Worms require sufficient air and damp conditions to digest your scraps to worm castings and rich compost. Composting is a simple, yet surprisingly rewarding, way to reduce the trash you send to the landfill and increase the quality of soil in your yard and garden. Many thanks to Ron Strauch at Milagro Compost who answered all of my compost questions and is a local expert on vermiculture (i.e. worm composting).